“Film Business Asia is a new company, created and run by some familiar names in Asian film: Patrick Frater and Stephen Cremin. Based in Hong Kong and with a reach across the Asia-Pacific region, the company is a next-generation film trade publication — less magazine and more market intelligence platform”. 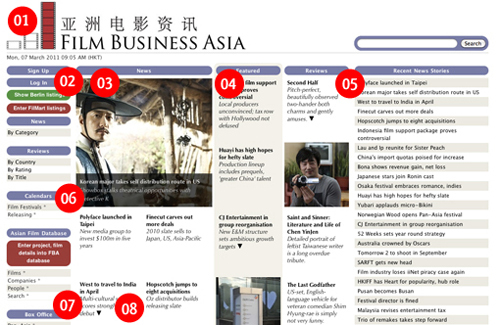 01 Film Business Asia: Aiming to be the go-to for industry information in the Asia-Pacific region, Film Business Asia currently provides quality, if not-yet comprehensive, news and reviews. Evolving since January 2010 (it had something of a public launch at Cannes last May), the site promises plenty of new features (see below). According to the Film Business Asia, India, Japan, and China are among the five most prolific cinema industries. The Asia-Pacific market increased 12% to $7.7billion in 2009, compared to North America’s $10.6billion. Although designed principally for these huge (and growing) markets, it is an excellent resource for cinema fans everywhere. 02 Remit: Think Asian IMDB Pro with the emphasis on quality and consistency. The site is largely English-language, is well-researched, well-designed and makes good use of stills. South Korea is particularly well-represented on the site, with a balance of coverage between Japan, and China / Hong Kong. However, India is surprisingly lacking to date. Different genres are present without any clear bias and a cursory look through the reviews shows the range of interesting issues that are currently being tackled in film. 03 News: Two to three stories daily, generally written by Patrick Frater, former Variety journalist and CEO of Film Business Asia (see below). Coverage falls into 18 categories, including Awards, Box Office, and Festivals. Frater’s journalism is solid and the writing relevant. The site needs to take on more correspondents in order to expand its coverage. 04 Features: Four key stories give an at-a-glance insight into the top issues as Film Business Asia sees them. These often relate to the interaction of different markets: how Australian production companies are funding Asian films, for example, or Asian involvement in US festivals and distribution. Currently, new stories will tend to cycle over a two-week period. 05 Reviews: For the casual reader, this is currently the site’s strongest area. Over 230 reviews have appeared since January 2010, usually at a rate of one or two per day. These can be accessed via a variety of views and are nicely organised and laid out. Each film is graded out of 10 and gets an authoritative synopsis, as well as comprehensive technical and production details. Whereas IMDB has begun to fragment over the years, the presentation here is clean. A sales contact is listed (for the Asian market) and reviews breakdown into 12 key countries: China / Hong Kong / India / Indonesia / Japan / Malaysia / Philippines / Singapore / South Korea / Taiwan / Thailand / Vietnam. Almost every review is written by Derek Elley, another refugee from Variety. Whilst there are no complaints about the quality of his work, the site would again benefit from more human resources. 06 Forthcoming features: This could be the special source. The founders of Film Business Asia have been compiling data which they currently offer as products. The homepage promises a range of services including release and festival calendars, box office charts, news tracking, various contacts directories and Stephen Cremin’s extensive database (see below), however none of this is yet functional. It is possible to add project and company listings to the database, which gets used in a number of ways. 07 Who’s behind it: Patrick Frater (CEO): “Over 20 years of experience as a journalist (formerly with Variety, Screen International and Hollywood Reporter) in three countries, an unmatched knowledge of the film business and a commitment to improving the professionalism of the Asian film business media, have brought Patrick to the point today where he launches Film Business Asia”. Stephen Cremin (CTO): “Stephen co-founded the London Pan-Asian Film Festival in 1998 before joining Far East Film Festival in Udine, Italy. He has also worked as a correspondent for Screen International in Taipei. However, his life work is a multilingual database of Asian cinema that has been in active development since 1993 and forms the core of Film Business Asia”. 08 Going Further: Film Business Asia has a functional Facebook and Twitter presence. Logging in allows users to create a profile and add their details to the databases mentioned above. The system is efficient, self-explanatory, comprehensive and generally well-thought out.